Happy 4th of July: Joe Gallo has been asked to speak at the Mensa Society of America! The United States Declaration of Independence is a statement adopted by the Continental Congress on July 4, 1776, which announced that the thirteen American colonies, then at war with Great Britain, were now independent states, and thus no longer a part of the British Empire. Written primarily by Thomas Jefferson, the Declaration is a formal explanation of why Congress had voted on July 2 to declare independence from Great Britain, more than a year after the outbreak of the American Revolutionary War. The birthday of the United States of America, Independence Day is celebrated on July 4, the day the wording of the Declaration was approved by Congress. I am looking forward to Speaking about my book "Boston Bronze and Stone Speak To US". The Talk entitled "Genesis Ingenious and Creativity in Boston Past and Present" at the Sheraton Boston Hotel Boston this July 3, 2014 at 12:00 PM to The Mensa Society of America. Over 1500 members will be there attending dozens of presentations further enlightening Mensa Society members. George S Patton Boston Monument, Veteran Remembered. Majestically standing, George Smith Patton, Jr., a resident of Hamilton, Massachusetts and a distinguished and courageous soldier, is one of the many pillars of the WWII American Military on the Boston Esplanade. whose buffalo nickel is familiar to every American. by the Commonwealth of Massachusetts, and erected in the mid-fifties, a decade after the general’s death. The Soldiers and Sailors Monument revisited. 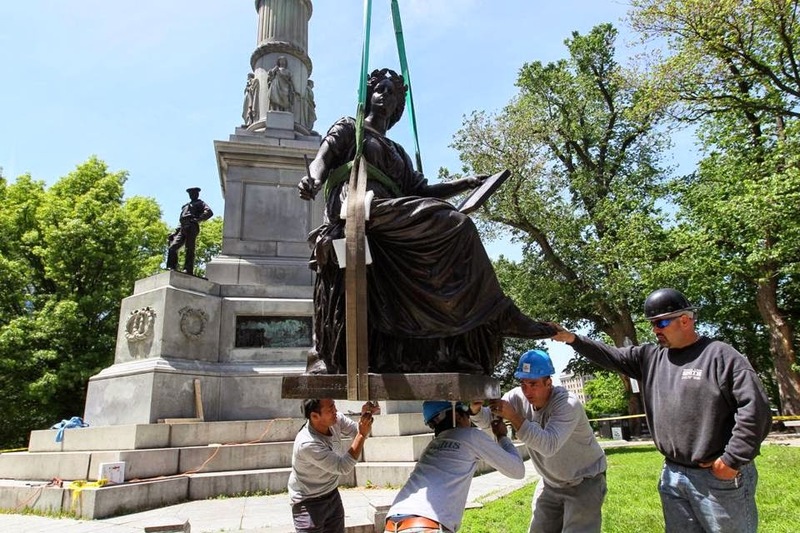 The Soldiers and Sailors monument on Flagstaff Hill Boston Common has finally been complete once again since its creation in 1877 commemorating the service men and women fallen in our American Civil War. The four ten foot bronze statues representing the Army, Navy, History and Peace are once again united to Martin Millmores' master piece on Boston Common. A mammoth $132,500 to restore this work of art and histoy negated the vandalism set upon this Boston bronze and stone decades ago. Boston has once again shown its strength and love for its' bronze and stones ( based on Jacqueline Tempera May 30, 2014 Globe article). Boston is America, America is Boston.